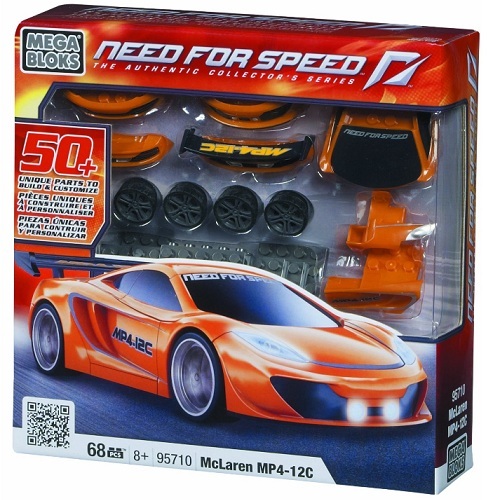 Product Detail Summary: The MP4-12C by Mega Bloks contains a McLaren M838T twin-turbo 3.8 L V8 engine that can go from 0 to 124 mph in under 10 seconds! The MP4-12C is built using state-of-the-art Formula 1-sourced technologies that let you redline the engine to limits that would rip normal sports cars to pieces. This street legal racer is painted metallic orange with the car's name "MP4-12C" painted on the doors! Customize your McLaren MP4-12C with cool interchangeable alternate front and rear spoilers to make your ride truly unique! Build, play and display your McLaren MP4-12C for the whole racing world to see!